Antti Rinne, Chairman of the SDP spoke at a party meeting in Hyvinkää on Saturday. Photo – Lehtikuva. 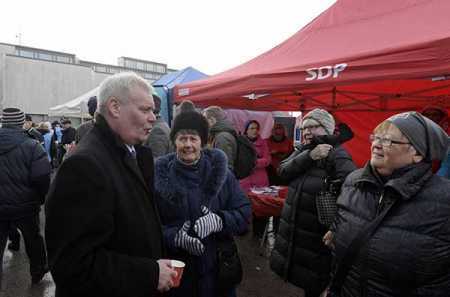 The main opposition Suomen Sosialidemokraattinen Puolue (Social Democratic Party of Finland-SDP) and Vasemmistoliitto (Left Alliance) have promised to review the social welfare and health care (sote) reform, if they are voted to power in next parliamentary elections. Antti Rinne, the chairman of the SDP said that the party plans to change Prime Minister Juha Sipilä's government decision on sote reforms if SDP comes to power in the next elections. He made the remarks in an earlier interview with Finnish language newspaper consortium Lännen Media. On Saturday Rinne spoke at a party council meeting in Hyvinkää where he revealed his intention to run for a second term as the chair of SDP. Rinne said that he had made the decision to run for a second term during the “autumn period”, and that he does not consider it a case of lack of confidence that he would be challenged for the position of party chair. Meanwhile, the chair of Left Alliance Li Andersson on Saturday at a party gathering said that the party will open up the issue of sote if it becomes part of the next government. The party launched its campaign on the defence of the social and health care services. The Left Alliance, according to Andersson is against the government plans of forced corporatisation and privatization of services. The chair of Kansallinen Kokoomus (National Coalition Party), a component of the three-party alliance governmrnt, Petteri Orpo said that it would be a complete catastrophic if construction of sote reform would start from the beginning.